Playing Top Girl for the iPhone and iPod Touch is a bit like eating fast food. It’s cheap, easy, and generally appeals to the senses, but once you’ve tried it and actually start thinking about it, you realize just how bad it is for you. Top Girl won’t make you fat, but it could turn you into a shallow, fashion-obsessed social climber without even realizing it. 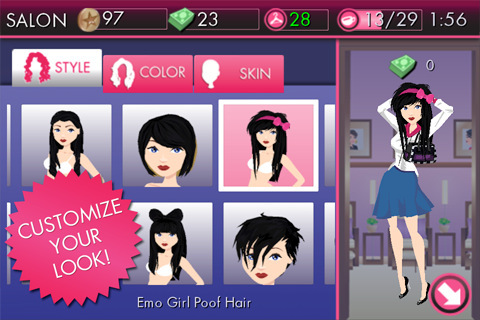 Top Girl is effectively what would happen if you mated Barbie with Farmville. Like most social network games, this one is light on the brain and heavy on the waiting, but Top Girl goes for the “gender-subtle” approach by splashing everything with a healthy dose of pink, sparkles, clothes, and boys. You start by customizing your own Top Girl. There’s no choice of facial features, so if you’ve got a problem with red lips and blue eyes, you’re out of luck, but you can select skin and hair color. The wasp-waisted silhouette is non-negotiable, however, and your girl will spend an awful lot of time vogueing around in her underwear as you play dress up, which is probably something for parents and the employed to keep in mind. Once you’ve got your look, it’s off to get a fancy modeling job and a man, because that’s really all girls care about, right? Jobs require energy, which gets slowly refilled over time, and they all have different energy requirements and earning potentials. The money you earn goes towards buying more clothes and spending it at the club to flirt with cute boys. Clothes are key to the game. Not only do more fashionable clothes help you catch a cute boys eye, but the more clothes you stuff in your virtual closet, the more job opportunities and open club doors you have. There are even stores that won’t let you shop there until you’ve amassed a big enough clothing collection. The clothes are broken down into two main categories: work chic and club, with promised “seasonal wear” looming on the horizon. Some clothes will work for both, but generally the clothes you wear will affect your overall appearance in different ways. Obviously, you want to maximize your club hotness when you’re going out, and you want your cute work clothes to shine when you’re at the office, but this usually means changing your outfits a lot, and your cutest outfit will not necessarily get you the best stats. Second to clothes are the boys. At the club, you can flirt with various men by wearing your hottest threads and sending over drinks. If you manage to impress them, you’ll find yourself with a new boyfriend. You can kiss your boyfriend every 3 hours to up your love meter, and filling the meter usually nets you a nice gift. Different men also come with different bonuses, like refilling your energy gauge faster or earning you more coins at work. The game seems to take the rather mercenary view that hot girls should always try to date the guy who will give her the biggest bonus, but unlike real life, it’s the girl who will always have to shell out for fancy dates to keep the guy interested over time. Because of the superficial premise, the game visuals are about as conventionally pretty as you would expect, although the repetitive soundtrack leaves a lot to be desired. Top Girl doesn’t add a lot to the genre, but even more disappointing was the overall lack of social elements. Although the game does come with OpenFeint integration, it’s shallow at best. There’s no real social interaction aside from comparing closet sizes. There’s not even much fake social interaction, as you can’t even talk to your boyfriend; just the occasional kiss and date. As this is a freemium game, you can always purchase extra coins or cash to help you fill out your wardrobe or replenish your energy quickly, but parents should be aware of this in-app purchase potential before handing it over to their children. Happily, you can actually do quite a lot in the game without spending any money, and you can even neglect the game for long periods of time without any major penalties, unlike most farming games, but the best stuff is still largely reserved for people who are willing to shell out the cash. Bottom line: Top Girl is pretty, but it’s also incredibly vapid and light on content. While easy to play and entertaining at first, the overall portrayal of men and women in this game is mildly offensive at best, horribly sexist at worst. And of course, there’s just not a lot to do in the game, so even if the shallow pursuits of the skinny and stupid don’t bother you, you’ll probably find yourself bored before long. AppSafari review of Top Girl was written by Tracy Yonemoto on July 7th, 2011 and categorized under App Store, Free, Games, Resource Management, Time Management. Page viewed 7470 times, 2 so far today. Need help on using these apps? Please read the Help Page.